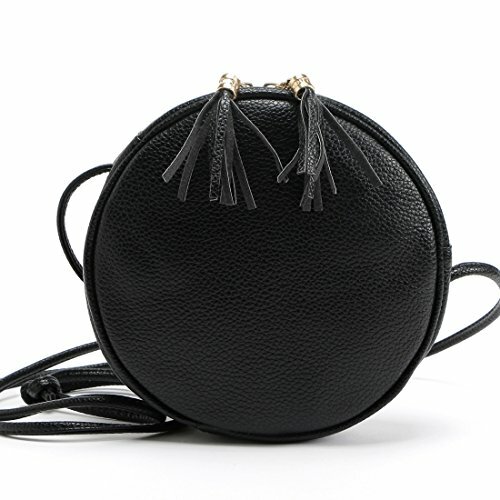 A mini circular crossbody purse, lightweight and not bulky, but roomy enough for your basic stuffs like cell phone, wallet, keys, glasses and some small cosmetics. Note: The crossbody strap drop is about 24 inches, it is right size for most women. DukeTea focus on leather products, especially in leather bags like crossbody purses, clutch purses, shoulder handbags, and coin purses. All DukeTea products have at least 3 months guarantee, some are longer. Thank you for choosing DukeTea. 1 zip compartment, large enough to hold big phone, wallet, keys. If you have any questions about this product by DukeTea, contact us by completing and submitting the form below. If you are looking for a specif part number, please include it with your message.